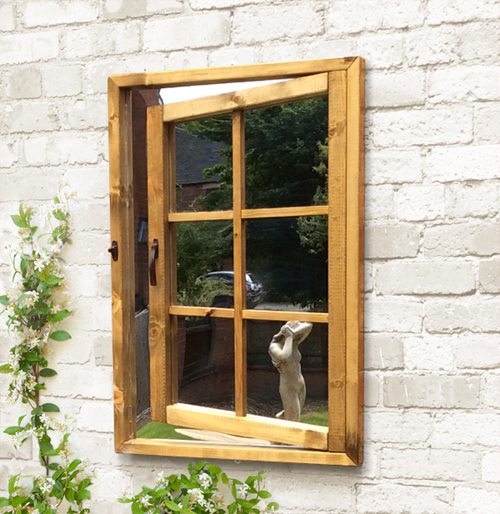 We bet that once you've bought this illusion mirror, you'll still have times looking out onto your garden when you'll question whether you actually have a secret window looking into another garden! Please note: this mirror comes in plain, natural wood as shown in the image below. It is not colour painted, although this is easily done. Please note: when the mirror arrives, the wood will have been pressure treated, but unpainted. We do recommend you either varnish or paint to prolong its longevity. Thanks to Mrs J for these fantastic photos of the mirror in her garden. She has painted the frame cream, we think this looks really effective. "Looks fantastic! Very very pleased :)"
"It would have looked good if the wood was in better condition. The one I received was rough sawn. And will take a lot of sanding and perpetration before I can paint it."